Description of "The Ethical Philosophy of Bertrand Russell (eBook)"
Based on full length book of the same title. A critical exposition of the ethical philosophy of Bertrand Russell. The author traces the development of Russell's ethical ideas from cognitivism (similar to G. E. Moore) to non-cognitivism (similar to A.J.Ayer). 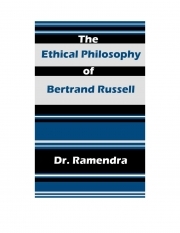 The ebook concludes with the author, Dr. Ramendra's critical comments on Russell's ethical ideas. Dr. Ramendra (full name "Ramendra Nath") is presently working as Associate Professor and Head of the Department of Philosophy at Patna College, Patna University, India; where he has been teaching for twenty-eight years. He is a double gold medalist and double research degree holder from Patna University. His Ph. D was on "The Ethical Philosophy of Bertrand Russell" and his D. Lit. Was on "M. N. Roy's New Humanism and Materialism". Both these works have been published as books. Dr. Ramendra is the author of nearly thirty books and booklets in Hindi and English, including 'Why I am Not a Hindu', 'Is God Dead? ', 'The Myth of Unity of all Religions' and 'Some Reflections on Ethics'. Besides, he has written hundreds of articles in newspapers, magazines and journals. Dr. Ramendra (born 1957) is married to Dr. Kawaljeet Kaur since 1981. Dr. Ramendra, along with his wife, is the co-founder of Buddhiwadi Samaj (Rationalist Society) and Buddhiwadi Foundation, two internationally known organizations for promoting rationalism and humanism. Dr. Ramendra's only daughter, Priya, is a software engineer and she works actively for the Buddhiwadi Foundation. Reviews of "The Ethical Philosophy of Bertrand Russell (eBook)"